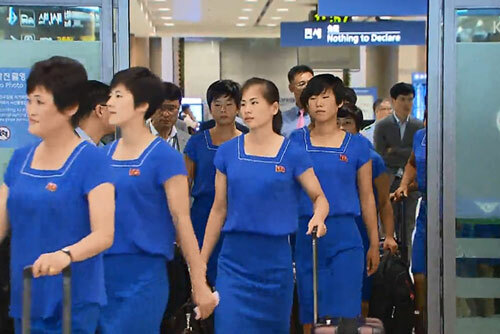 North Korean athletes have left for Indonesia to attend the Asian Games, which is set to kick off next week. The North's official Korean Central News Agency(KCNA) reported that a delegation led by the vice minister of physical culture and sports departed from Pyongyang on Friday for the Jakarta Palembang Asian Games. The quadrennial sporting event will draw around 11-thousand-300 athletes from 45 countries for 16 days from Saturday of next week, with medals up grabs in 40 sports. At the tournament, the two Koreas will field a unified team in dragon boat racing, women's basketball and rowing. The North Korean members of the joint teams have been training with their South Korean counterparts in the South since they crossed the border late last month. This marks the second time the two Koreas are fielding joint teams at a multi-discipline, multinational sports event, following the joint women’s ice hockey team that competed at the PyeongChang Winter Olympics in February.